After dropping a close game to the short-handed Washington Wizards, snapping OKC's eight-game win streak, the Oklahoma City Thunder flew across the country to Denver, CO for a matchup against the eighth-seeded team in the Western Conference. The effects of an Andre Robertson-less defense were at an all-time high as Jamal Murray and Gary Harris heated up from long distance to start the contest, while Nikola Jokic led the pack with his third triple-double of the season. Despite an improbable comeback in the fourth quarter, Denver edged out a 127-124 victory over OKC. Defense was the problem throughout the majority of the contest, or lack thereof. The Nuggets got off to a 23-13 lead through the first half of the opening quarter and that quickly parlayed into a 40-point quarter. Offensively, OKC was doing well, scoring 33 points of their own. Per usual, Paul George was the pacemaker for the Thunder early with 11. Their defensive woes weren't nearly over. Things seemed to get progressively worse for OKC, despite Geroge hitting shots from everywhere on the court and Russ well on his way to 20 assists. The Thunder and Nuggets were evenly performing through 18 minutes of play. Even in assists (20), rebounds (25), free throws made (3) and turnovers (5-3) but three-point makes? Denver 11, OKC two. Simple math will tell you that's a 27-point difference. They only ended up outscoring them by eight in that third quarter but still led by 15 points at halftime. A 72-point half against the Thunder certainly wasn't ideal but there was still a feeling that OKC could make a comeback. Contrarily, the third quarter was treacherous for the Thunder as they found themselves down 20 points at a certain point. At that moment, a Thunder victory seemed bleak. The surprising story of the night that changed the entire headline to this story was the resurgence the bench made. A severely criticized bench did the impossible. Billy Donovan metaphorically waved the white flag by pulling all of his starters, more importantly, George who was the only Thunder player that could generate anything offensively. That was Donovan supposedly resting his players for their matchup at home the next day. Well, seven points from Jerami Grant and a bucket from Raymond Felton and Patrick Patterson combined with a dry spell from Denver offensively, the Thunder just trailed by 10 points with 7:30 left to play which forced Donovan to put his starters back into the game one-by-one. George added to his spectacular night by scoring at will. Denver had absolutely no answer for what George was doing and it showed. He scored 14 points in the fourth quarter as Russell suddenly heated up like he wasn't having one of his worst scoring performances of the season. Westbrook scored 10 of his total 20 points in that final quarter and the Nuggets lead trimmed down to one. That was until George nailed a 26-footer to even the score at 124 with one second left and every indication pointing towards overtime. Denver's Harris had something to say about that. 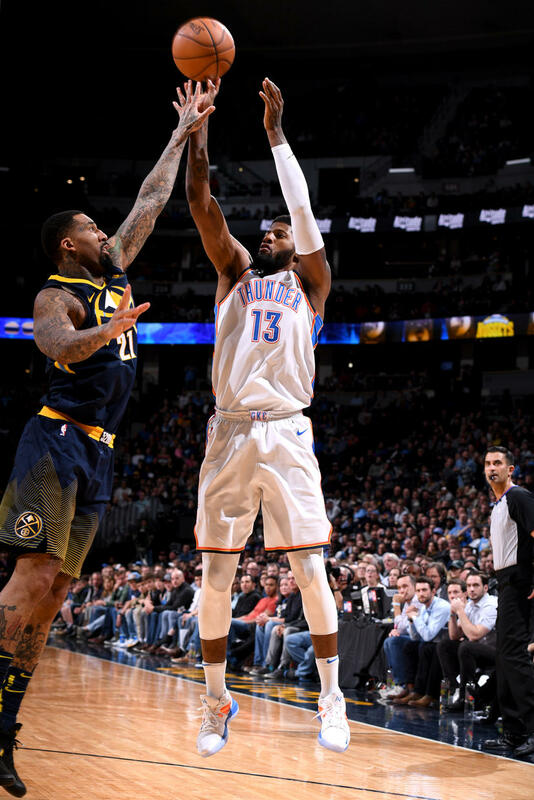 As he torched the Thunder throughout the game, his literal last-second heave from 25 feet away from the basket went in and the Thunder dropped their second straight to Denver 127-125. Just like many Thunder games, this buzzer-beater that caused them to lose probably shouldn't have been. Yes, Westbrook lost Harris on the final play by looking completely bumfuzzled in the middle of the lane but Wilson Chandler may have committed an offensive foul on Jerami Grant by trucking him in the scramble. And lastly, Jokic (the inbounder on the final play) clearly traveled, taking a few steps while inbounding the ball, which should have been a turnover in favor of the Thunder. — Jerami Grant on Wilson Chandler during the last play. Despite the controversy, OKC dropped their second straight and their defense looked extremely weak throughout the majority of the game. Their fight was inspiring and very impressive, which proves their tenacity but against the NBA's best, their defense doesn't look like it'll hold up without their anchor, Roberson. There won't be much time to ponder on this game because of a quick turnaround against the seventh-seeded (27-22) New Orleans Pelicans on Friday night in the Chesapeake Energy Arena.